A couscous salad is not only healthy and delicious but can be made in approximately 45 minutes without too much fuss and requires no cooking. First take the couscous and submerge it in twice its own volume of hot water, before leaving to soak for approximately 15 minutes. Next, take the remaining ingredients and mix well together before leaving to stand for approximately 45 minutes. During this period the flavours from within the ingredients should be released and develop. Once this has happened you may serve your couscous salad. If you are feeling more adventurous it is possible to give your couscous salad a Mediterranean twist without too much effort. You can make a Mediterranean couscous salad in less than an hour. First take a large bowl and place the couscous inside before mixing in the hot stock. Once you have done this cover the bowl leave the contents to soak for approximately 10 minutes. Next you need to make the dressing that will go with your Mediterranean couscous salad. First take the salt and pepper, lemon juice and olive oil and mix 2 tablespoons into the couscous. Once you have done this mix the avocado, nuts, olives, tomatoes and feta. Once this has been completed take the salad leaves and mix with the dressing, ensuring that they are well coated. Next place the salad leaves on plates and top with couscous. 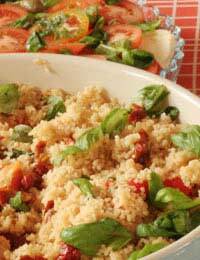 To make a tangy couscous salad is very easy and quick. First cook the couscous in your vegetable stock and then take the courgettes and after having sliced them, drizzle oil over them before placing under a hot grill for approximately 3 minutes before turning them over and cooking for another 3 minutes. By this time the courgettes should be relatively soft. Once you have done this take a large bowl and place the courgette slices inside and mix well with the ingredients that are left.